Civil society organisations demand to stop land grabbing by the Agro-industrial Company Socfin and to protect the human rights of the communities. On the 16th of June 2016, a group of Sierra Leonean Civil Society Organisations, held a press conference in Sierra Leone’s capital, Freetown, to celebrate the release of six MALOA activists (Malen Land Owners and Users Association). These individuals have defended the rights of the Malen communities following land grabbing by the Socfin Agricultural Company Ltd., a subsidiary of the Belgo-Luxembourg group Socfin. A petition in support of the MALOA struggle was also handed over to the President of Sierra Leone and called for the end to the criminalisation of human rights defenders in Malen. On the same day, West African members of the Global Convergence of Land and Water Struggles and international civil society organisations sent a letter to the President urging to cease violations of the communities’ right to food and nutrition and requesting that the land dispute in the region be resolved peacefully. Since 2011, Socfin Agricultural Company has acquired over 18,000 hectares in the Malen region in southern Sierra Leone, for an industrial plantation of oil palms. From the outset, communities have denounced the lack of transparency and participation in these agreements and the negative impacts on their rights and livelihood. As a result, several community members gathered at the heart of the MALOA organisation in an effort to uphold their rights. Regrettably, they are consistently confronted with repression and judicial harassment. Following several incidents, dozens of MALOA members were arrested and imprisoned. In February 2016, after more than two years of trial, 6 MALOA leaders were sentenced to up to 6 months in prison or fines totalling over $ 35,000 for crimes of “conspiracy”, “incitement” and “the destruction of 40 palm seedlings”. Crimes for which they pleaded not guilty. Local communities and international civil society mobilised and coordinated a fundraising campaign against this unjust sentence in support of the 6 leaders. This display of civic solidarity eventually led to their release between February and May 2016. “We are delighted to have contributed to this release, which will help appease the anger of Malen communities,” announced Joseph Rahall, executive director of Green Scenery, an environmental and human rights organisation in Sierra Leone. 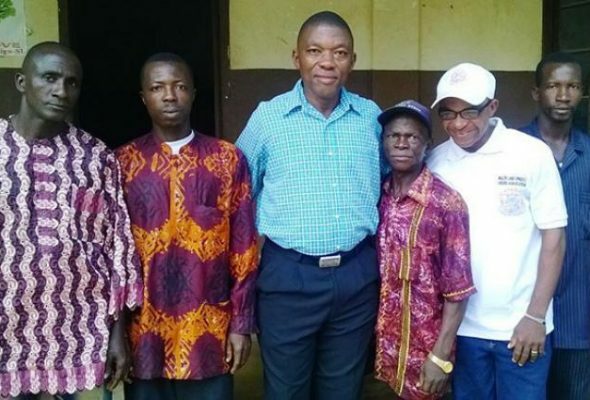 “We are back to continue defending the rights of our Malen brothers and sisters and to seek a peaceful solution to the conflict,” stated Shiaka Sama, one of the six executive members who faced imprisonment and spokesman of MALOA. During the press conference, a petition asking to protect the MALOA activists and to put an end to their criminalisation, and which gathered more than 120,000 signatures from across the world (through Rainforest Rescue sites, Peuples Solidaires-ActionAid and Avaaz), was also presented. The petition was to be handed over to the Government of Sierra Leone after the event. In parallel, more than forty organisations from the social movements in West Africa, members of the Global convergence for Land and Water Struggles and organisations of international civil society, drafted a letter calling on the government of Sierra Leone to take the necessary measures to ensure the respect and protection of the human rights of the Malen communities. Additionally, the signatories urged international partners of Sierra Leone to intervene in favour of a peaceful resolution of the conflict in accordance with their extraterritorial human rights obligations, particularly in the context of the implementation of the guidelines on land governance in Sierra Leone and the “land partnership” agreement concluded between Sierra Leone, the FAO and the Federal Republic of Germany. See the letter to the President of Sierra Leone and the background of the case (pdf, June 2016). You can also see a previous letter by the Global Convergence for Land and Water Struggles – West Africa in support of Maloa. For more information about the arbitrary detention and judicial harassment against several members of MALOA, visit the Observatory for the Protection of Human Rights Defenders here. Photo: Civil society mobilised for the release of the 6 MALOA leaders.